The well known Earthdawn fanzine Tableau Infractus by Drucifer is now in issue #9. I can only recommend to have a look at all the other issues too. They are a great resource for GM and players. Part 1 of a fiction story called Brew Eyes. An Interview with Aaron Brown, scupltor of Redbrick's Miniatures. Earthdawn Legends as audio files? 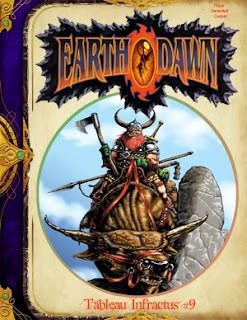 Dammi opened a discussion thread on the RedBrick forum regarding the question if Earthdawn fans would be interested in audio files in which Earthdawn Legends are told. The files would be released in addition to the forthcoming Earthdawn Legends book (no release date yet). At the forum you’ll find a poll, discussions and of course a detailed description by Dammi about this idea. A sample mp3 file is available at the RedBrick download section to get an idea what this project could look like. The sample tale is called “The Legend of Rune and Sangblade” made by Markus Watt and Dan Boice. Would you want this? Would it be useful? What do you think? Discuss it at the forum. Barbaren! or Barbarians! was yet only available in German but RedBrick announced that the English version of “The Ultimate Macho Roleplaying Game” is coming soon.